Nothing is worse than arriving at the gym, energized, fueled, hydrated and mentally ready to work out…only to find you cannot lift the weights because the calluses on your hands are in tremendous pain or one has ripped off mid-workout. Calluses are caused by lifting weights for long durations over an extended time period, meaning if you’re working to build muscle, you’re likely to experience a few yourself. 1. Avoid the activity that is causing the calluses. No, this is not a crazy idea—you may have to change your workout style for a bit until your calluses decrease. If calluses are forming as a result of bench pressing with an Olympic bar, for example, use a bench press machine, or perform a variety of push-ups. 2. Change the way you grip the bar. If you typically perform the barbell bench press with a wide grip, try a narrow grip to change the point of pressure on your hands. You can also grasp the bar closer to your fingers than in the middle of your hand to reduce pressure on callus sites. Another option is to use afalse grip, in which you place your thumb on the same side of the bar as your fingers, instead of wrapped around the bar. These small changes may take the pressure off of your hands and help prevent calluses. 3. Keep already-formed calluses in check. If you are suffering from callused hands, there are things you can do to try to keep the hardened bumps to a minimum. Soften your hands in warm water and then using a pumice stone, a grater or nail file, smooth out the rough skin. You do not want to remove the callus completely as it is providing protection to your hands. After smoothing out the skin, apply lotion. 4. 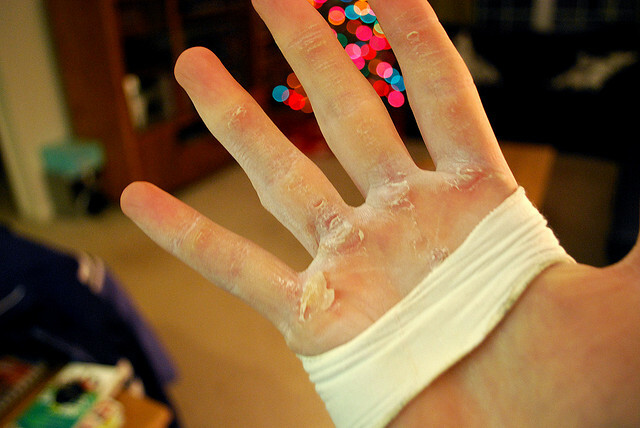 Wear weight-lifting gloves. One of the easiest ways to prevent calluses caused by the friction of exercise equipment on your hands is to provide a barrier between your sensitive skin and the equipment. Lifting gloves cover the areas on your hands that are prone to calluses. Gloves do not interfere with your workouts and may make your session more enjoyable and more rewarding. When you are not dealing with the pain caused by callused hands, you are able to lift heavier amounts of weight and achieve the progress you desire. Select gloves that fit well, so that they do not slip and you end up with another issue-blisters. What are the Benefits of Using Neoprene Weight Training Gloves?